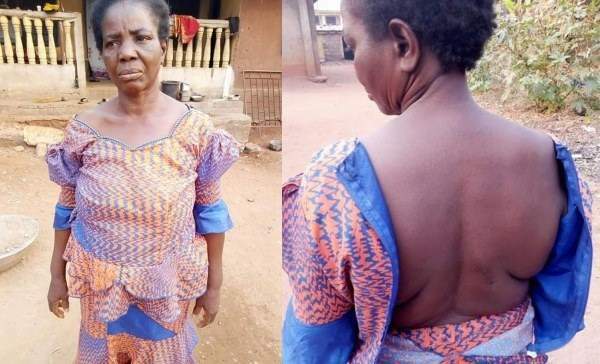 An Anambra widow identified Mrs. Anthonia Aniemene, reportedly fell sick and died after allegedly forced to drink a concoction by her husband's relatives. The widow who was married to one Elder Emma Aniemene, was reportedly forced to drink the concoction over her late husband's properties. The late widow's nephew, Agozie Ofuonye, wrote an open letter to Anambra State Governor, Willie Obiano. 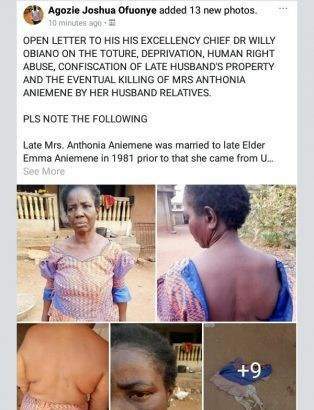 OPEN LETTER TO HIS HIS EXCELLENCY CHIEF DR WILLY OBIANO ON THE TOTURE, DEPRIVATION, HUMAN RIGHT ABUSE, CONFISCATION OF LATE HUSBAND'S PROPERTY AND THE EVENTUAL KILLING OF MRS ANTHONIA ANIEMENE BY HER HUSBAND RELATIVES. That Chimezie at this time got married and because he couldn't feed his family left Onitsha to Aguleri to start dragging house rent with Mrs. Anthonia in her husband's property. That this matter of land tussle had been brought before the larger family and he had been asked severally to leave the woman and her husband's property alone, yet he refused. That on the 2nd of January, I personally went to see Mrs Anthonia Aniemene who happens to be my Aunt and foster mother, she asked me to drop her off at Ivite Aguleri, that the Aniemene's have put a meeting to reconcile the issue, only for her to get there one Mr. Joe Aniemene, ,Chibuzor Aniemene, and Chukwudi Aniemene bundle her in a waiting vehicle to an unknown destination. They bought a juju priest, who mixed a substance and asked her to drink it, she refused, telling them that it is against her faith, meanwhile they had already torn her clothes, her bra and undies and made her naked. (attached is Mr. Chukwudi Aniemene's confession on facebook, boasting that they really beat up the police officers).